this year i didn't get too festive with halloween. instead i carved a pumpkin and decided to dress my pumpkin seeds up! if you like spicy and sweet try this out! 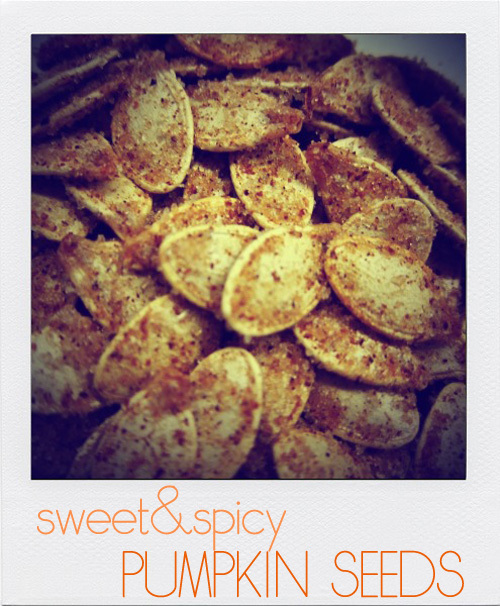 In a large bowl, stir together 2 tablespoons of sugar, the cumin, cinnamon, ginger, and cayenne pepper, and set aside. Place the pumpkin seeds on the baking sheet with parchment paper, spray them with cooking spray. Bake the seeds in the preheated oven until lightly golden, 20 to 25 minutes. Heat the oil in a large nonstick skillet over medium heat, and stir in the toasted pumpkin seeds with 1 tablespoons of brown sugar . Cook and stir the seeds until the sugar forms a coating on the seeds (2 to 3 minutes). Stir the caramelized seeds into the bowl of sugar-spice mixture and voila! Whooooo I'm first to comment on this blog!!!!! Yummy pumpkin seeds!!!! Perfect for the holidays!